Blinkist has a difficult story to tell. 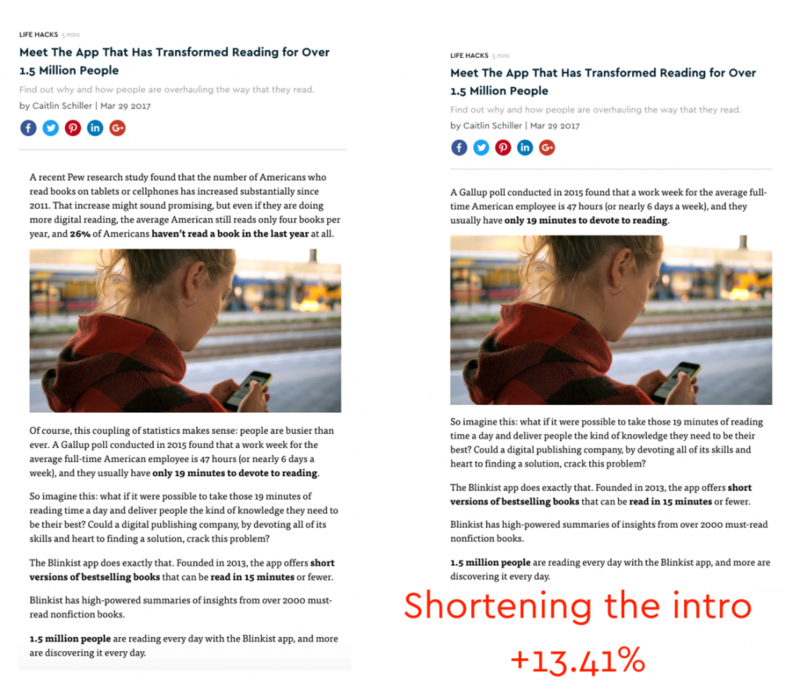 The reading app which compresses non-fiction books into 15-minute summaries can’t be easily explained in the two sentences available in a Facebook ad, nor in a simple visual format for banner ads. They had to find another way to get the word out. This led Blinkist to embrace content marketing in its traditional form with the Blinkist Magazine — producing content with the goal of improving how you work, think and grow. Though, what’s unique about Blinkist is the other component of their content strategy — a performance-driven approach to producing and promoting content with the sole purpose of acquiring new users. I sat down with Sandra Wu, content marketing specialist with Blinkist, to go step by step through their content marketing strategy that drives 50,000 people to download Blinkist every month and gather some tips for getting started yourself. The success of any content marketing operation is grounded in a deep understanding of your users. Not just any user, but your ideal user. These are the people you want to attract with your content. These are the people you are writing for. The question remains, how do you identify these users and start to understand their interests so you can produce content for them? For that, I’ll point you to a great article by Devesh Khanal perfectly titled: Customer-Content Fit. With this persona in mind they can qualify every idea with a question: Would Allen or Skyler be interested in this topic? Admittedly, the age and gender aren’t what’s important, but rather the mindset of their target user. Just think, not all of your target users fit neatly into the box you want them to. Blinkist could have 18 year old users that, because of their aspirations to be a business leader, have a very similar mindset to the standard profile of Skylar or Allen. With their target customer in mind, it’s time to start producing content. This process is slightly different than the traditional content format you’ll find in Blinkist’s Magazine. In their magazine, you may find articles that aren’t directly related to their product like. “Dropping the Mic: Is Your Facebook App Listening to You?” Whereas the content Sandra works on is produced with the sole purpose of acquiring new users with paid promotion. This paid-content can take two forms. Either it speaks directly to the Blinkist product with the whole article explaining why Blinkist is great and why you should download it; or, it takes an editorial form that’s not so direct. You can think of the former as an 800-word sales letter and the latter as more of a highly-targeted traditional content marketing piece. Some of Blinkist’s promotional pieces image credits. In terms of what is more successful, Sandra says it’s actually the content that isn’t so salesy. Take that ‘reading habits of highly successful people’ article for example. How interesting it is for their target audience. This is Blinkist’s recipe for producing content that attracts not just any readers, but their ideal users. You find a topic that is compelling, closely related to your product, and is interesting for your target audience. Then, all you have to do is give those readers a way to convert into users. Turning a reader into a user is as much an art as it is a science. For Blinkist, the way they do this largely depends on the type of article they’re promoting. 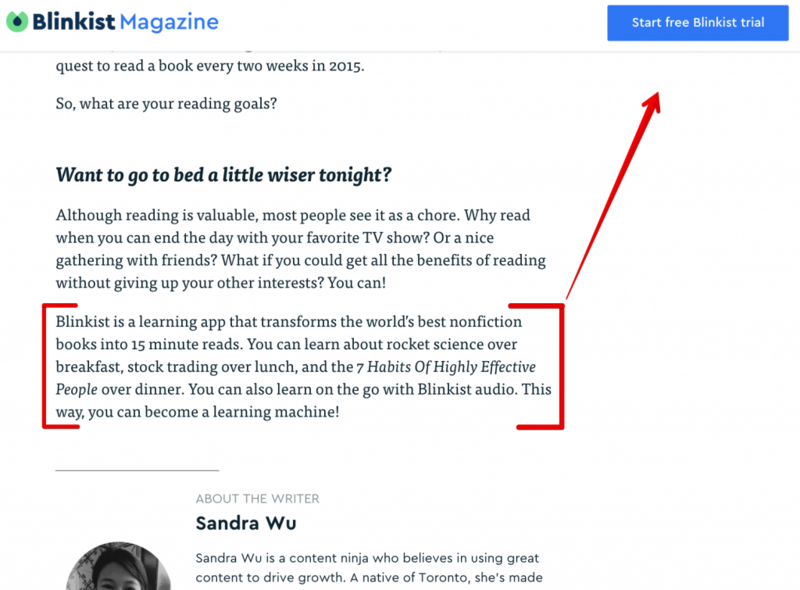 For articles like ‘Meet Blinkist..’ there are various opportunities to convert into a user. They often have call-to-actions at the top of the post, off to the sidebar, in the middle of the post, and at the bottom of the post. Something to keep in mind is Blinkist has a single call to action that they repeat across their entire site: Start a free trial. Having a singular call to action across their site allows them to simplify their conversion funnel. This is just one of many ways you can optimize your content for conversions. For a ton of really good advice on this topic, I recommend checking out this article on ConversionXL. 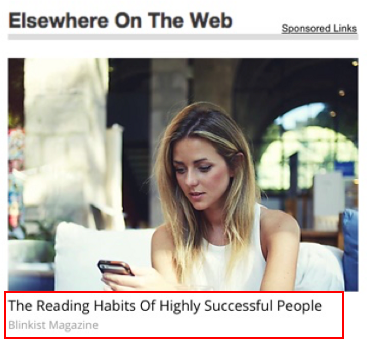 For Blinkist’s editorial-style articles (reading habits of…) there is a much greater focus on the content rather than the conversion. For these posts, there is often only one or two CTA’s throughout the post. Of course, they’re constantly testing this (more on that later…) but when asked about what works best? Take this as an important reminder that the quality of your content will determine your success. Yes, ‘quality content’ is subjective at best but you know it when you see it. Rather than producing a bunch of low-quality posts, focus on producing a few that you’re proud of and spending more time promoting them. 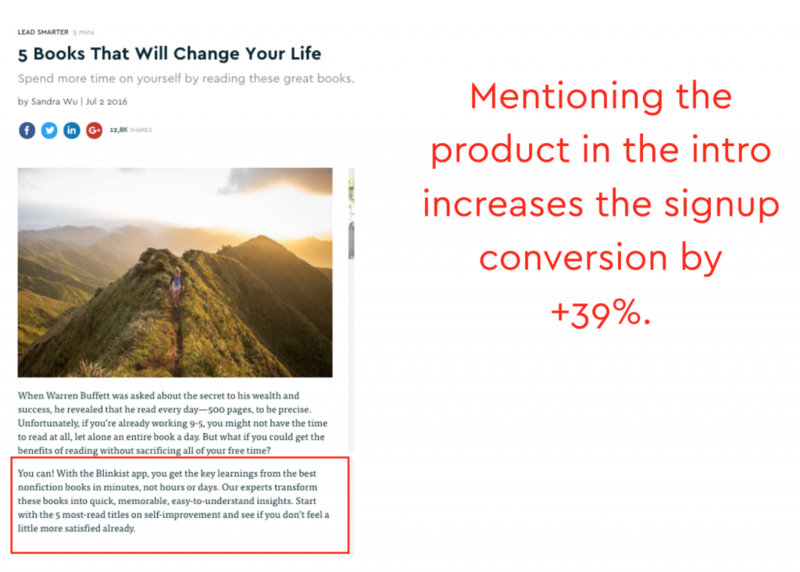 As with Blinkist, if someone reads a relevant, engaging, and targeted piece of content that’s related to your product, converting users is easy. This is where Blinkist’s performance-driven approach starts to turn away from traditional content marketing. Rather than simply publishing a post to their social media accounts and relevant communities, they rely on paid placements to put their content in front of readers. The sections in which the article appear are usually at the bottom of a page and are frequently called “From around the web.” The articles in this section are separate from the journalism pieces because they’re denoted as paid advertising. Both services use algorithms to select content (generated by companies like Blinkist) to suit the preferences of individuals who visit the sites to populate advertising sections. 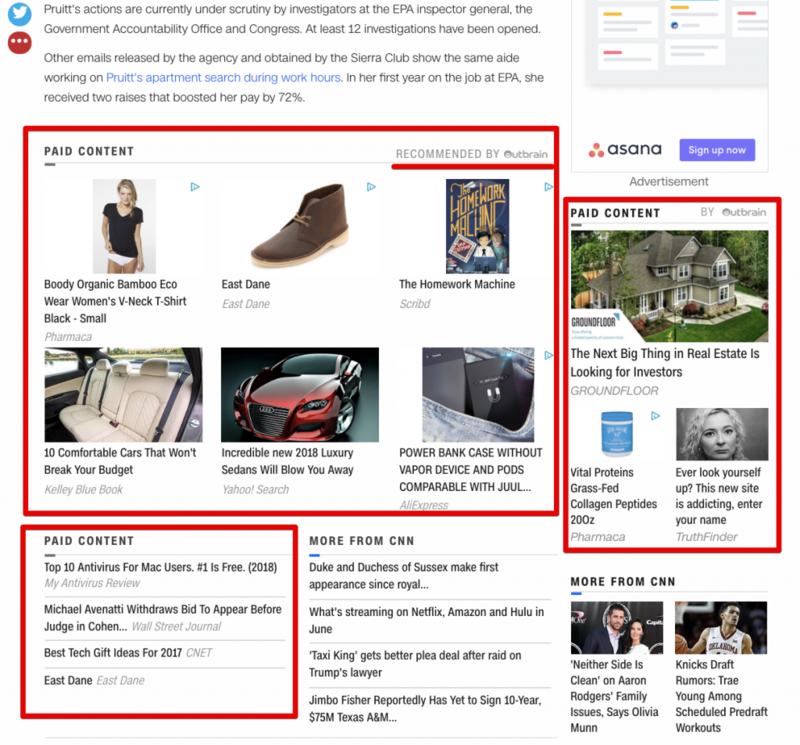 While they also experiment with Facebook and occasionally experiment with paid-newsletter placements, the bulk of their promotion is done using Outbrain and Taboola. For Facebook, they use look-alike audiences, a targeting algorithm Facebook uses to replicate your existing audience by finding profiles similar to them. According to Sandra, this is the only way they’ve been able to find success with Facebook. This is important because Outbrain and Taboola only charge on a cost-per-click basis. Meaning your article can be recommended to a million people, but you will only get charged by the ones who click through to read it. 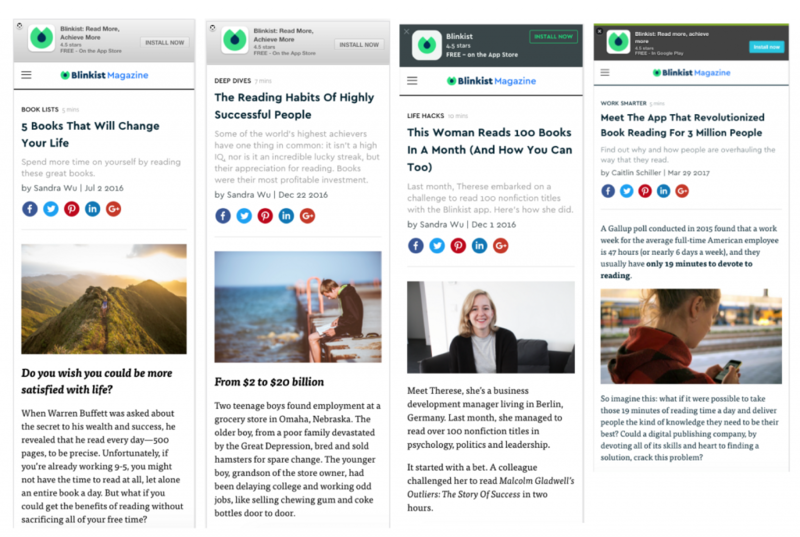 By producing highly-targeted content for their target audience, Blinkist can be sure that anyone who is interested in their article would be their target customer. Not surprisingly, a title like “The Reading Habits of Highly Successful People” works to filter out anyone who isn’t interested in reading. These advertising placements account for 60% of Blinkist conversations/downloads. Conversions from organic traffic account for the other 40%. One of the biggest pains for traditional content marketers is once a piece is published it’s out of your hands. Sometimes you may think that blog post you’re about to publish is going to be embraced and shared endlessly by your audience, only to have it flounder. While other times you publish a post on a whim and it takes off like a rocket ship. In either case, it’s hard to know why one post lagged while the other excelled. Was it the headline, the introduction, or the strong opinion throughout the post that made the difference? This is why Sandra’s performance-driven content strategy is so powerful — it’s informed by data. As Sandra puts it, “we constantly run AB tests… we might be doing five tests a week.” Unlike a traditional blog, Sandra is able to get statistically significant results from her tests because she’s using paid channels to drive traffic to her posts. This allows every piece of content can be looked at as an MVP. It sometimes takes Sandra a few weeks or a month to get an article to where they want it to be in terms of conversion rate, ROI, etc.. If you were to take this approach, once an article is released you can go back and change the title, switch out the featured image, move your CTA, and even completely reformat your post. Along the way you can keep the winning elements and discard the losers, improving your article over time. This begs the question, which elements do you test? With every test comes new learnings and some delightful surprises. After reviewing the almost 100 different tests they ran last year Sandra came away with a ton of insights. What makes this data and test-driven approach to content so powerful is the ability for learnings to carry over into every new piece. Every test they run provides them with knowledge as to how they can start the next post off even better. This article has given you a look into how Blinkist structures their content marketing strategy from start to finish. But without the right mindset, you may never succeed. Whether that’s not giving yourself enough time to succeed, not dedicating enough resources, or just giving up because you realize content marketing is hard. For every thriving content marketing operation, there’s 10 more that have done everything right, but still fell short. For Sandra, success comes down to a few critical factors that have nothing to do with words on the page, resources, or skill. 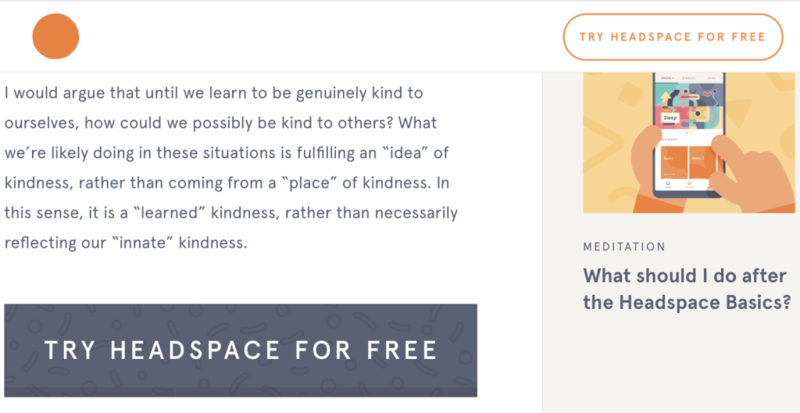 Blinkist used to have ideation meetings in which people from different departments would offer suggestions for content. But it became, “too complicated.” So now Sandra works with the Blinkist magazine editor to develop ideas and the editor makes the final decision on what gets produced. Then her editor writes the post and hands it off to Sandra, who gets it ready for publishing. Anyone can still propose ideas, but it’s not done in a meeting — and certainly not driven by consensus. Acknowledging that it will take time to achieve results is an important expectation to set for everyone, according to Sandra. It takes time to learn what content your target audience enjoys and to make matters worse, this will continue to change over time. This means there’s no definitive ‘correct approach’, which makes content marketing challenging and frustrating. Sandra cautioned that a successful content operation takes time to develop and maintain. She isn’t interested in posts that go viral because they don’t teach her much.